His lecture on the Montgomery bus boycott spanned three class periods. 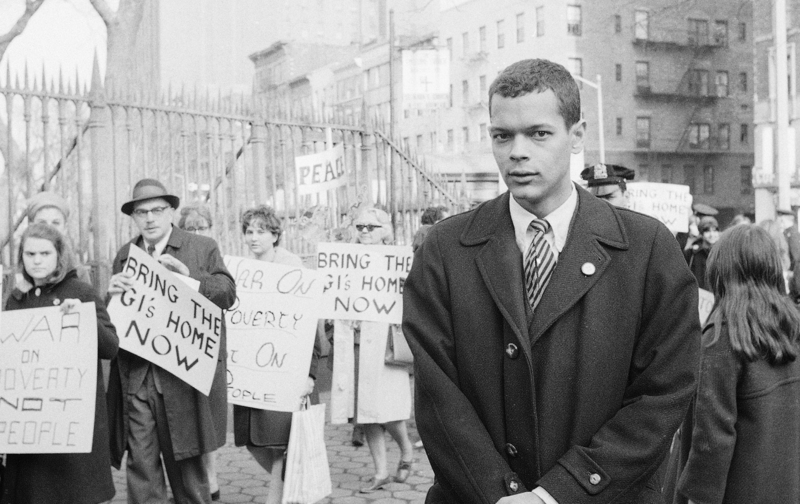 Professor Julian Bond traced the origins and development of the boycott, in the hours and days after Rosa Parks’ arrest. Character by character, he detailed the various people who came together to turn Parks’ bus stand into a movement in Montgomery and how they sustained that effort for 382 days. On Saturday night, August 15, Julian Bond died after a brief illness. The 75-year-old civil rights leader had been a founding member of the Student Nonviolent Coordinating Committee (SNCC), whose courageous direct action changed the systems of racial inequality in voting, jobs, schools, and public services in the South. Elected to the Georgia state legislature in 1965 , Bond was then denied his seat because of his opposition to the Vietnam War, fought and won it back twice, and served for twenty years, first in the House and then in the Senate. Continuing his commitment to social justice, he served as the first president of the Southern Poverty Law Center and as chairman of the NAACP. And for the past 25 years, he had also been a professor at Williams College, Drexel University, the University of Pennsylvania, Harvard University, American University, and the University of Virginia. Julian Bond was a titan of social justice leadership and a lifelong freedom fighter. But alongside that persevering voice for justice, one of his greatest gifts was that of a teacher and movement intellectual. To teach about the movement was a further way to carry it forward to a new generation — and he thrilled to this. When I was an undergraduate, I had the great good fortune to take his class on the civil rights movement, and then a few years later to serve as one of his teaching assistants for that class. For over two decades, he has been an extraordinary mentor and friend. A year ago we talked about the possibility of doing a book from those classroom teachings, but he wanted to work less, not more. His death feels ground-shifting and enormous — and so to honor that legacy, here are five things he taught me. Movements are made; they don’t just happen. It wasn’t “Rosa Parks sat down and the people boycotted the buses.” Those three class periods he spent on the bus boycott showed not just what happened but how it happened. They indelibly changed how I saw and now teach the civil rights movement. In the popular narrative, the movement arises. It just happens. It is the perfection of the American dream. What Julian Bond showed so vividly was that people made decisions. There was nothing predestined about it. America wasn’t naturally moving toward justice. People chose, amid searing conditions, amid threats to their person and their livelihood, to make it happen: Rosa Parks called Fred Gray called Jo Ann Robinson; E.D. Nixon called the ministers and reporter Jo Azbell; Jo Ann Robinson snuck into her office at Alabama State College and ran off 35,000 leaflets; and on and on. By showing how the civil rights movement happened, he showed us how to imagine how we do it again. The civil rights movement was not created by presidents or charismatic speakers but by the efforts and freedom visions of everyday local people possessing great courage and vision. And those local people have to be known, their particular contributions detailed and lifted up. And so he did: Annie Devine, Earl Steptoe, Johnnie Carr, Fred Gray, Unita Blackwell, the Rev. T.J. Jemison. And many, many of those people were young people, often teenagers themselves—Barbara Johns, Mary Louise Smith, Ernest Green, and Julian Bond’s many friends and colleagues in SNCC—who shone a mirror on the nation and began to force it to confront its original sin of systemic racial injustice. Young people lead, he would teach, and the nation will ultimately be forced to follow. Movements take years and decades. The civil rights movement began long before it was publicly recognized, long before the Brown decision and the Montgomery bus boycott, and continued long after the Voting Rights Act was signed and the TV cameras packed up and went home. And so did Julian Bond’s commitments: His ardent opposition to the Vietnam War and South African apartheid. His persistent, public support of gay rights, refusing to attend Coretta Scott King’s funeral because it was to be held not at the King family church, Ebenezer Baptist Church, but at a homophobic mega-church. His steadfast criticism of the Tea Party as the “Taliban wing of American politics.” His last arrest in 2013, tied to the White House fence protesting the Keystone pipeline. He rejoiced in this new movement of Dream Defenders and Dreamers and Black Lives Matter activists, saying they reminded him of himself when he was young. Mentoring matters. A just and democratic struggle means enabling each person to find her/his voice. That was the leadership that SNCC embodied, Julian Bond taught us. Ella Baker mentored them. Highlander Folk School mentored them. Older NAACP activists in the Deep South mentored them. One of my favorite stories he told about Ella Baker was how she would sit with them in marathon meetings listening, asking the occasional question, helping them figure their way to their own answers. These meetings would stretch long into the night—and people would smoke. Miss Baker would sit there with a mask on because she had trouble breathing, but she was going to sit with them until they got to where they needed to go. Carrying on that tradition, Julian Bond mentored others. Like Ella Baker with her mask, Julian Bond was not a fair-weather mentor. He didn’t just write a blurb or letter of introduction — either of which would have been an incredible honor. He was a movement mentor, understanding what it takes to help someone find her voice. He spent years with me agitating for scholarly access to Rosa Parks’ papers (which have finally now opened at the Library of Congress), co-authoring an op-ed with me, making calls, sending letters, making more calls. He came to one of my early bookstore talks (even though he’d read the entire book months before) and then decided the NAACP board needed to hear this expanded story of Rosa Parks’ lifetime of activism and arranged for a talk. No question was too small or insignificant; he would email right back with advice or thoughts on ways to proceed and often sent notes of encouragement and delight. Julian Bond’s generosity was epic. Over the past twenty four hours, the Internet has filled with stories of the countless other activists and scholars, community leaders and students he inspired and aided in their efforts to press for social justice and tell this history. And the responsibility he leaves us to continue the struggle for justice is epic too. In one e-mail, as I grew discouraged by what seemed the futility of our efforts, he wrote, cajoling me onward, “I am a hopeless optimist; I always believe things will work out.” Rest in power, Julian Bond. Your lessons continue.